You may have heard of, or even used this little tool called Google before, where over 1.17 billion people go to find things on the internet? But, are you aware that Google is much more than just a search engine? In fact, Google has a ton of free tools in addition to its search engine that can be very valuable to you as a content marketer. Here’s the thing, whether you love or hate Google, you must admit one thing, you’ve used one of the free tools it offers at one point in time – and the good thing is that you have the convenience of being able to access all these tools with one login. 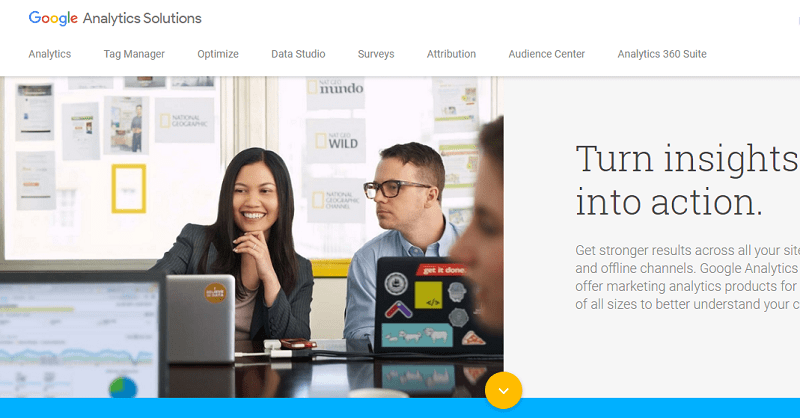 Content marketers, in particular, should take advantage of these Google’s free tools to maximize and get more out of their content marketing campaigns. With all these out of the way, below are the five free tools from Google that you should start using right now as a content marketer. Most time, content marketers find it hard to come up good blog post idea for their website, especially when they desire to always sound relevant and current – I’m sure you can relate to that feeling, I mean…you certainly would not deny it. …That is where Google Trends comes in. It will help you to get newer ideas to write content on. Google Trends can be used to check the trending topics together with the “trending stories” to ascertain if there is something relevant to your industry. For example, any topics that relate to politics and in some cases, celebrity lifestyles are sure to be trending. You can always figure out good ways to connect these things to your content marketing concepts if you’re in such niches, and want to create a viral post. For instance, whenever you write something about politics, you already know there is a lot of information available. If you haven’t tried Google trends before, now is the time to do so. How many of your website visitors are coming for the first time? How many are returning visitors? How long are visitors spending on your site? How’s your bounce rate (High or normal)? If you give me a solid answer to these questions, then you don’t know what you’re doing, and your content marketing campaign will suffer tremendously. If you need a great tool to be checking and monitoring your website traffic, Google Analytics is dope. Good enough, Google Analytics provides valuable answers to all of these critical analytical questions. This tool can give you great insight into your site’s overall performance and help you to fully understand how people are discovering and navigating your website. These are just a piece of the iceberg to what you can do with this tool; it is arguably the most powerful tool offered by Google to content marketers. And the most interesting thing like I stated earlier is that…It’s completely free. However, I want you to understand something here – website analytics is certainly not a replacement for marketing analytics (the difference can be found here). Want a great insight into your site’s overall health, and how Google sees it? Just create a Google Webmaster account. Google Webmaster Tools is an excellent free product from Google; it gives you an enormous amount of valuable data about your website and content marketing campaigns – It’s surely a must-use tool for webmasters. Interestingly, if you’ve already created a Google Analytics account for your site, you can quickly and effortlessly add it to Google Webmaster Tools to start monitoring the following. Site Health: In this section, you’ll see your site’s stats, crawl errors, malware alerts, and blocked URLs. Site Configuration: This section monitors your website’s settings on the internet, including preferred domain canonicalization, change of address, site links, users who have access, and URL parameters. Site Traffic: This section includes internal links, search queries, and +1 reports. Site Optimization: This section contains your content keywords, sitemaps, HTML improvement suggestions, and other resources. Another interesting thing about the Google Webmaster Tool is that it will notify you to any red flags that could hinder your website from getting found in Google search results, and also help you to accurately analyze your existing search traffic so you can better understand how visitors are currently discovering you. Apart from that, Google Webmaster Tools also gives you an option to view reports to find broken links and to de-index the pages that were accidentally indexed in Google. Although there are a lot of great keyword research tools available in the market which can give you excellent results, Google Keyword Planner remains one of the best. As far as keyword research is concerned, the popular Google Keyword Planner is one of the most suited tools for the job, no doubt about it. There are lots of wonderful stuff to be liked about this tool including its user-friendliness. As a serious content marketer, it’s your job to always search for those kinds of keywords needed to significantly boost the performance of your content in Google SERPs. However, the only requirement needed to use this tool would be to experiment with it thoroughly. You need to run some number of searches to understand better how it functions. You can also run multiple searches so as to get a different perspective on how it works. For example, “content marketing” could be one of your target keyword, but you certainly know how difficult it is to rank on the first spot with such “short tale” keyword. 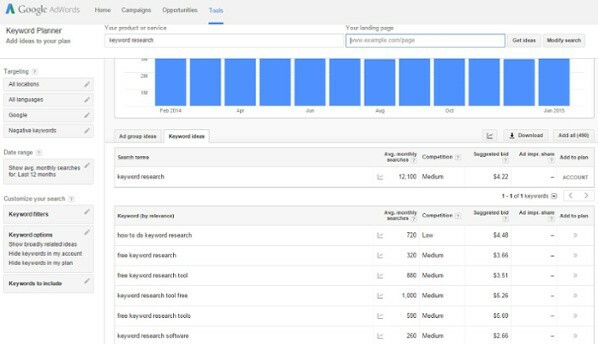 But with the Google Keyword Planner, you can come up with some interesting, long-tail, and easy to rank keyword variations that are closely related to that target keyword of yours (content marketing). However, you must understand that “Google Keyword Planner” is just a basic tool, but it is one of the most powerful “Free Content Marketing Tools” for serious content marketers who would like to research their keyword strategy to increase their search results. Finally, this tool is incredibly easy to use, but bear in mind that you have to create an AdWords account to use the Google Keyword Planner as it’s meant for Google’s AdWord advertisers, but that doesn’t mean you definitely have to create an ad. Just a simple Google account will do. As you know, content creation is a big part of content marketing. If your business/job involves a lot of writing, ensure you’re 100% comfortable with the tool that you’re using. 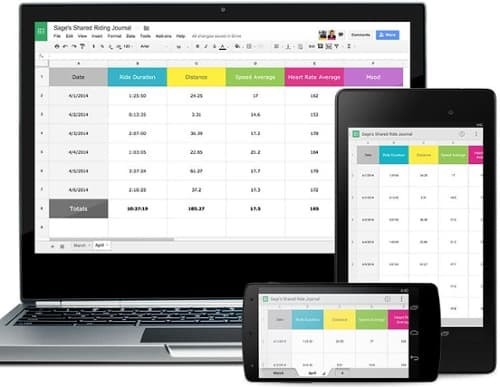 Google Docs is an easy file sharing platform used for sharing spreadsheets, drawings, documents, tables, and presentations with others to download or edit, view online, or just to grant access to a “read-only version” of a document. Furthermore, you can also create forms and send them directly in an email or via a link to collect crowdsourced post information, survey answers, and other valuable data. I know there are many other options out there like the modern Microsoft Word, but right now, Google Docs seems to be a perfect choice. These are some of the free Google tools for content marketers that you really need to start using right now. Although there many other excellent free tools offered by Google, the five I mentioned here will be most useful to you. Now, for the fact that less than 50% of B2B marketers are claiming to be effective at content marketing this year, it means that there’s still room for improvement, you just have to start using these tools immediately to know your competitors off the ladder. Personally, I love all the tools developed by Google, and will also use as many of them as I found valuable and needed. I’ll also urge you to do the same because you will never go wrong with these tools. I love all of these google tools! I use these, except google trends. These tools come in very handy, especially when you are doing SEO. I highly recommend new bloggers to use these tools to their advantage. Learn how to use them right as well! Glad to hear that you’re also in love with the tools. The truth is that most times, we can’t possible do without them. Very important piece of information over here. Google Analytics, Google Webmaster tool and Google Keyword Planner. Thanks a bunch for all the supports. I’m sure you’ll find the tools very useful as you said, just try and play with the ones you don’t know yet on the list. Most of these tools are not new to me. But, now I see why we can use Google Trends along with Google Keyword planner. That’s smart! Glad to hear you’re already familiar with most of the tools here. Thanks for coming. Google Analytics and Google Webmasters tools are one of favorite tools. It helps me to monitor my site traffic and performance in search engine rankings, which helps me to take vital decisions about my marketing strategies Thanks for sharing these great tools with us all. Thanks a lot for the heads up. Those two Google tools are indeed badass, you can never go wrong with them :). I am using all the above mentioned Google tools. So, Thanks for sharing this great post. Good to see you here. I’m happy you’re already leveraging the tools for your content marketing efforts man. Great list of google free tools. Really, these are very useful tools in content marketing. I use all of them except google trends. Here you have explained the features of these tools very nicely. After knowing the amazing feature of google trends tool am going to try this. Google Trend is indeed very useful once you’ve mastered it. Use it to complete the other tools here, and it will make things easier for you. Above mentioned tools are more important for SEO it’s very easy to use for SEO beginners I recommend these tools for the beginners. Google Analytics and Google Webmasters tools are one of the important tools. It helps me to monitor my site traffic and performance in search engine rankings. Great to see you here too. All the tools I mentioned here are indeed very helpful, but I do think that Google Analytics and the Webmaster Tool are super helpful. Glad you’re making use of them. Thank you for this post… Really appreciate your writing skills. All the tools I mentioned here are indeed very helpful. Google Trend is indeed very useful once you’ve mastered it.